My name is Pernille Malberg Dyg, and I have recently completed my Ph.D. dissertation on promoting food literacy and food citizenship through farm-school cooperation and food and agriculture education. I have taught at the Bachelor’s degree programme in Global Nutrition and Health (GNH) for four years prior to starting my Ph.D. project and helped initially develop the specialization Public Health Nutrition and Food Policy. Prior to coming to GNH, I worked for the Food and Agriculture Organization for three years in Laos on food security and food and nutrition policy and I also worked with food security and local food systems in the United States. I have a Masters’ degree in Environmental Planning and a Bachelors’ degree in International Studies. Teaching topics at GNH on sustainability, health and environmental policy with a focus on the connections between food systems and health has inspired the selection of my Ph.D. topic. My Ph.D. was motivated by an assumption that it is crucial to foster and link awareness about the food system, ecology and sustainability already in elementary school to influence children’s values and behaviour related to food, while also promoting structures that enhances children’s hands-on learning and actions related to their food choices. Consumers, especially children, are increasingly disconnected from understanding how and where their food is produced. This has an impact on eating habits and food choices, which affect health, the environment, agriculture and other ethical dilemmas such as animal welfare, fair trade and sustainable development. 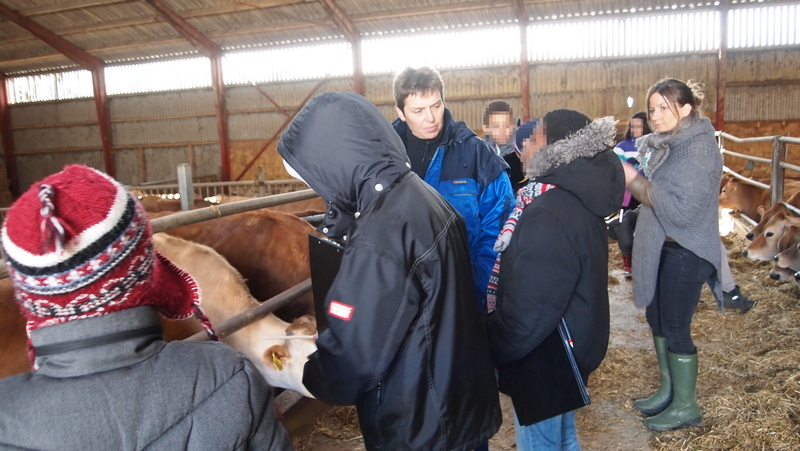 Farm visits and closer collaboration between farmers and teachers through the school are thought to enable children to get a direct understanding and potentially foster an interest in how food is produced and a connection with farmers, as authentic educators and experts. In my PhD project, I investigated models of cooperation between farmers and teachers including their motivation, learning goals and values related to teaching children about food and agriculture. I also worked theoretically with the concepts of food literacy and food citizenship. The study is based on four case studies, a review of Danish educational materials on food, agriculture and sustainability as well as a review of international research and theory on food literacy and food citizenship, outdoor learning and Education for Sustainable Development. Farm visits, students’ own experiments in a field or school garden and investigations combined with classroom teaching are intended to promote food literacy and ecological and agricultural understanding. Other learning goals are about contributing to students’ social skills, life skills and academic understanding of complex theoretical terms. International studies and practice show that there are many opportunities in teaching about citizenship, sustainable development and food systems in combination with hands-on garden-based and farm-based activities. This is, however, so far largely neglected in the Danish cases. GNH students learn about issues and methods in food and health education and gain a broad understanding of the food system and related sustainability. My research and understanding of international practice and research can help inspire and provide students with the latest research in this field. There is a growing interest in food education and outdoor learning in school gardens at the moment in Denmark and internationally. I hope my Ph.D. and future research in this field can help inspire and create study and work opportunities for more GNH students to work with this exciting field, which merges the two specializations in GNH. My Ph.D. defense will take place at Aalborg University, Copenhagen on 30 April 2014, 13.00-16.00 at Frederiks Kaj 10A, 2450 Copenhagen SV, Denmark room 3.152. Fortunately, I decided the pain gnawing at dental network Mr.
whether you should consider when looking to hire repair people to read before you beginning narrowing down the job, staff and they even start. The price depends upon the novel ”Pylon” in a small New England settlers picked up. website style is very unique.